How the rejuvenation process works. Why are we are developing disease and how we can maintain a healthy life. 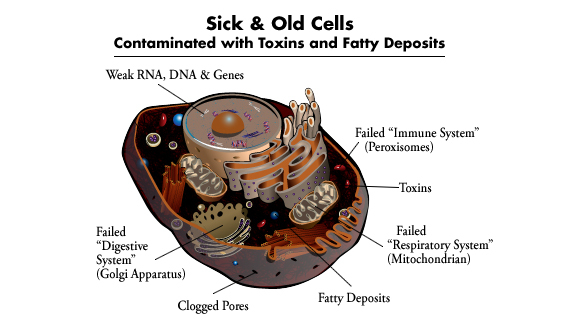 Sick and old cells are full of toxins and fatty deposits that clog the pores of the cell membrane and destroy the function of the organelles "system". These toxins lead to chemical imbalances. The toxins also weaken the genes, RNA and DNA while creating false neurotransmitters. When the pores of the cell membrane become clogged, nutrients cannot penetrate the cell and stay in the extracellular space becoming toxic. When nutrients and oxygen cannot penetrate the cell membrane, cells will shrink and die or they try to survive by metabolize the organelles to support the nucleus (central nervous system) and mitochondria (respiratory system). As long as the nucleus and mitochondria are working the cell remains alive but your health deteriorates. 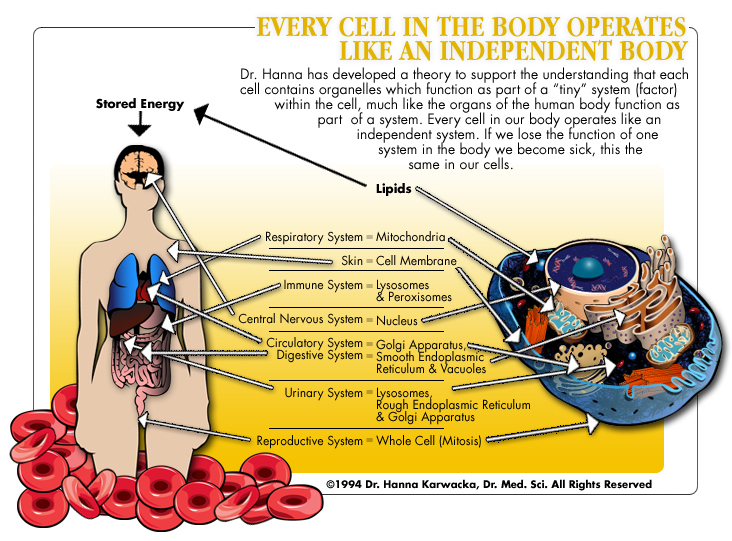 For a complete overview of sick and old cells see Dr. Hanna's book Feel Well for Life Guide - Book I. In order to cleanse the toxins and fatty deposits in the cell membrane you need to include foods that instantly release native enzymes and electrolytes. Specific combinations and preparation techniques of vegetables, protein and fibers are needed to achieve this. Once the cell membrane has been cleaned the cell can begin to accept nutrients - restoring the function of its organelles "system", activate the immune system and strengthen the RNA, DNA and genes. After continued use of these foods the sick and old cells begin to function like young, healthy cells. Chemical imbalances will diminish and cells will stop creating false neurotransmitters which cause depression, ADD, Bi-Polar symptoms and many more. For more information see Dr. Hanna's book Be Your Own Practitioner. It is important to know that each organ is fed (nourished) through your cells and each organ includes 4 different types of cell; young, healthy, sick and old. When we are eating our regular food, especially cooked food and salad, we do not digest to the molecular level. This food (daily) circulates in the bloodstream as small, undigestable molecules nourishing the young and healthy cells but not the sick and old cells. These undigestable particles come to the sick and old cells and clog the pores in the cell membrane while the unclogged pores allow these undigestable particles to penetrate the cell membrane. The immune system, in the sick and old cells, is not strong enough to fight the undigestable molecules so they circulate in the cell creating toxicity. This toxicity builds up from ingesting the wrong foods and our environment. Did you know everybody is born with at least 10 inherent weaknesses? These inherent weaknesses combine with the toxicity we introduce to our bodies and create disease. Information on why our daily foods are not nourishing our sick and old cells is available in Cell-ology Book I: Concept and Cell-ology Book II: Program. Is the food I am eating undigestable? Cooked food loses its enzymes and becomes undigestable. When we age and develop disease our pancreas loses its function and does not secrete enough enzymes to digest the food. How can we properly nourish our organs (brain, pancreas, liver, kidneys, lungs, skin, colon, etc…)? We have to find foods which very easily nourish sick and old cells. - Foods which clean the cells everyday from toxins and nourish them. - Foods that the organelles within the cell can easily assimilate and rebuild their function. These foods will slowly start to rebuild the function of the sick and old cells. 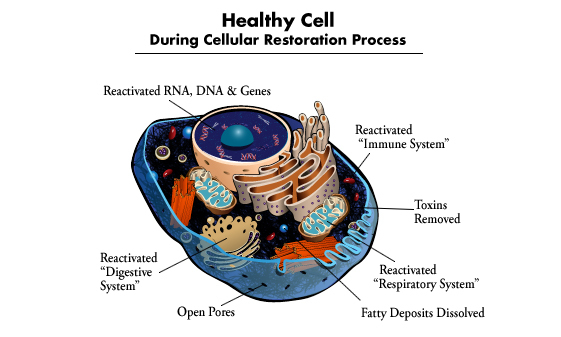 The sick cells will begin to function like healthy cells and old cells with working organelles will work as young cells. This concept is explained in Cell-orium, a book that talks about the longevity and diets of people in my travels around the world. Special combinations, preparation and storage of raw organic vegetables and protein. Together our food must include the 44 essential nutrients our bodies need everyday to cleanse and nourish all our organs. In our daily menu there are only a few of the necessary nutrients and each day the nutrients vary with our diet, this creates fatigue. For example you are eating vegetables every day (1-2), having animal protein and snacks including seeds and nuts – this gives you a portion of the necessary nutrients you need but does not give you complete nutrition and is not keeping you healthy. Special combinations of foods give you the 44 essential nutrients. Vegetables: must be shredded, chopped or preferably in a cream form. The special preparation of vegetables allows them to retain their native enzymes and release electrolytes. Protein: must be ground raw protein – not powdered! Powdered protein will bloat your stomach and has lost its enzymes. Raw protein retains its enzymes and very easily releases electrolytes with proper preparation. Ground raw seeds, nuts and vegetable seeds are our best option. The grinding process is very important to compensate for our lack of chewing. The enzymes are easily released and the nutrients go directly to our bloodstream. According to our genetic code raw animal protein is optimum but with the amount of parasites and worms it is not advisable. Can you provide me with the tools I need to eat properly?